Fat Tug is a northwest style India Pale Ale that is characterized by an intense hop profile of grapefruit & melon and restrained malt notes. At 7% alc/vol and 80 IBUs this beer delivers layers of aroma and flavor that is sure to satisfy anyone with a thirst for all things hoppy! 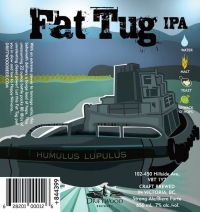 Fat Tug IPA is available in British Columbia in private liquor outlets and on tap in select pubs & restaurants.